As summer winds down, we start to look back the many little road adventures that dotted the season. The largest and last of these trips, of course, was to Portland, which included a large stretch of northern California. We begin on I-505, which heads north from I-80, bypassing Sacramento. I-505 is a completely straight, flat, stretch of highway. This is pretty much true of the surrounding landscape as well, but the texture and details against this blank canvas can make for some interesting photos. I-505 merges into I-5, which continues northward through more of the relatively flat landscape, repeatedly crossing the Sacramento River in the process. Eventually we come to the city of Redding at the northern end of the Sacramento Valley. On my return trip from Portland, I finally had a chance to stop in Redding and visit the Sundial Bridge. This modernist architectural gem spans a wooded section of the Sacramento River completely, a world apart from the town of Redding itself or the strip malls and shopping centers that line the highways. Here, clean modern lines contrast with the natural forms of trees and running water. The Sundial Bridge turned out to be a great subject for abstract photography (you can see another shot in an earlier Wordless Wednesday). It was also quite crowded with families and groups, something to keep in mind should I ever want to use it as a setting for a more formal photo shoot. North of Redding, I-5 climbs into the southern Cascades towards Mount Shasta. The highway here is quite scenic, but also narrow, winding, and treacherous. Eventually it opens up as one passes Mount Shasta and approaches Black Butte. Black Butte is a satellite cone of Mount Shasta. It has a distinctive pointy shape and largely barren rocky texture, both of which make it quite prominent in the landscape. The highway curves around its edge, providing a close-up view. After passing Mount Shasta and Black Butte, I-5 descends into a wide valley, passing by the town of Weed, whose welcome sign is a popular backdrop for photographs. This is the start of US 97, which heads northeast towards Klamath Falls and central Oregon as I-5 continues due north through the Cascades towards Portland. The main street in Weed is also Historic US 99. The part of the historic route which returns to I-5 is now California Highway 265, one of the shortest in the system. From here, the valley descends and opens further, and the landscape becomes surprisingly desert-like. We pass the town of Yreka, where I did not get a chance to stop, but might on a future trip because of some idiosyncratic road-geek things. 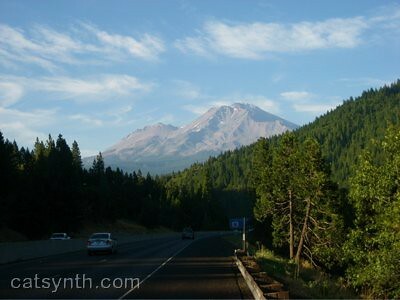 Finally, the highway climbs upwards again towards Siskiyou Summit, just north of the Oregon-California border and the highest point on all of I-5 at 4,310 feet (1,310 meters). 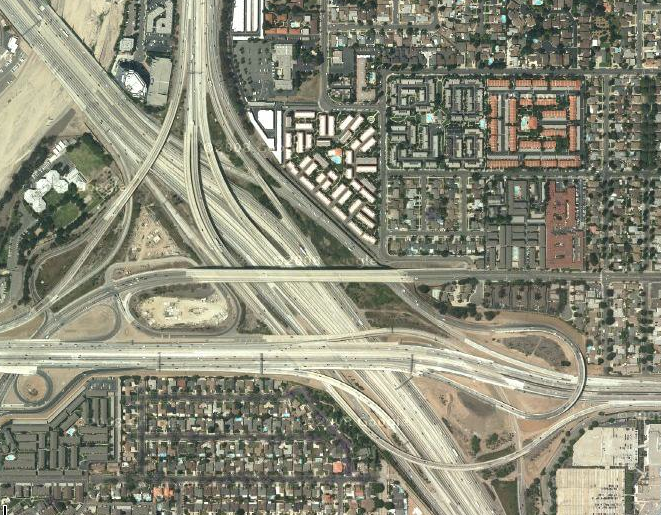 This afternoon we at CatSynth avoid our responsibilities by presenting another highway interchange. 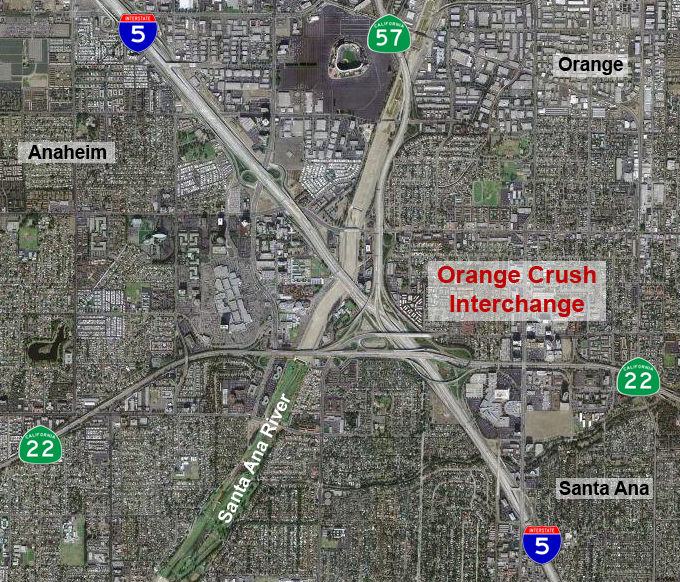 I actually got to know this interchange quite well during my recent NAMM trip, and ended up at one point or another on each of the highways. There is actually an ulterior motive in doing a highway post today. I am planning on doing a few posts on the intersection of art and highways (no pun intended). While I have collected a few examples myself, I would welcome suggestions from readers. This is the first of several articles on my recent “grand loop” through northern California in August. Starting from the Bay Area, north through the Sacramento Valley to the Cascades (including a side trip to Lassen Volcanic Park), and then west to the Mendocino coast and back south to San Francisco. The segment of this trip is along I-80, crossing the Bay Bridge and north through Berkeley into the towns of the “North Bay” that always seemed remote even when I was lived in the area. I-80 crosses over the New Carquinez Bridge into Solano County, ultimate towards Sacramento. In order to head north without having to get too close to our state's capital or Arnold, one takes the short-cut known as I-505 into the Sacramento Valley. This is a largely agricultural region of fields and orchards, and it is flat. As in “how much more flat could you be? None more flat.” (Apologies to Spinal Tap). Somehow, sheep are always instant humor. I am not sure why, but it's a fact, they're just funny even when they're not doing anything. We need to confer on them some sort of hip cult status befitting their character. Baaaa! Whether we are seeing haze or the infamous Central Valley pollution in this photo isn't clear (no pun intended). The Sutter Buttes are actually quite a distance away from I-5. One surprising characteristic of the Sacramento Valley, at least during this visit, was how humid the air felt, so it could easily just be haze. Pretty much things continue this way along I-5 until one reaches Redding, the largest city in California north of Sacramento, and the gateway to the Cascades. Very quickly, the highway begins to climb into the foothills, winding its way along the sides of hills and over high valleys (one of which was flooded to create Lake Shasta). No sign of Mt. Shasta. The directions to get there includes those famous words “You can't miss it”, but a first time traveller might begin to doubt that aminst the endless steep green hills and valleys. But then, there it is. And yes, you can't miss it. 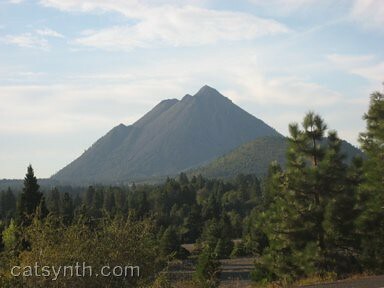 “Pointy Mountain” turns about to be Black Butte, a nearby lava dome (not to be confused with Black Butte in Oregon). It is clearly visible from the town of Mt. Shasta on the other side of I-5 (town on the east, peak on the west).